R.M. Ahmoses extensive background in psychology plays a key role in the three short stories presented in R.M. Ahmose Presents Tales You Never Saw Coming. Add this element to the keen observations taken from life in the inner city of Baltimore, and a plethora of knowledge gained from university classes, and the result is an imaginative, quirky collection of stories that elicit deep thought and expa… nsive thinking.R.M. Ahmose Presents Tales You Never Saw Coming is a collection of three stories, each of which is meant to delight with its imaginativeness, quirkiness, and sometimes eyebrow-raising social commentary. While robots are the stated central characters in the lead story Better Design, this tale actually highlights features of human society. Saved blends religion, devoutness, doubt, agnosticism, and ill fortune. The final story, Psychotherapy and Desserts, presents a tale of intrigue based on an experience at a community mental health center.A suspenseful collection of stories, R.M. 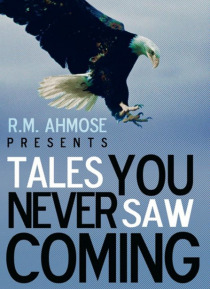 Ahmose Presents Tales You Never Saw Coming pays heed to the idea that nothing is as it seems.